The division of Social Medicine is actively engaged in research on a variety of different topics relating to the fields of family medicine, social medicine, epidemiology, geriatrics, health economics, preventive medicine and public health. Research is based in both the clinical and basic sciences and draws upon the faculty’s extensive experience in the social, behavioral and public health sciences. The faculty also actively participate in a variety of teaching, educational and training programs, including postdoctoral training and graduate education through the Master in Public Health programme. Most faculty members also serve as thesis advisors to MPH students. SMGH has a memorandum of understanding (MoU) for a collaboration in education and research in the field of public health with the National Institute of Health and Family Welfare in New Delhi, and a second one with the Public Health Foundation of India for educational and research activities, under a collaborative agreement concerning public health, and environmental health and climate change. Part of the agreement covers student and staff exchanges. SMGH has a recently initiated a research collaboration in the field of youth sexual and reproductive health and rights with the Medical Faculty at the University of Delhi. Presently, two PhD exchange students are registered at SMGH. Associate Professor Anette Agardhheld a SASNET/ABF Thursday lunch seminar talk on Thursday 18 April 2013. The presentation was about ”Improving Youth Friendly Health Services in India”, based on experiences and results from a National Training Programme on Improving Youth Friendly Health Services in India. See the poster. The programme is a joint venture between Lund University, Mamta Institute for Mother & Child, India and the National Institute of Health and Family Welfare, India. It has been implemented at a national level with financial support from Sida since 2008. The programme aims to strengthen participants’ capacity on delivering youth friendly health services to address the sexual and reproductive health concerns of young people. It has targeted around 120 medical doctors and programme managers from the public health system and has had most successful results with approximately 50 of the participants initiating adolescent clinics in their existing facility or opened new clinics. Studies conducted have also shown that the majority of the participants have changed their attitudes towards young people and do now recognise and actively address their sexual and reproductive health and needs. Because of the successful result, the Government of India agreed to take over and run the training programme from 2013. 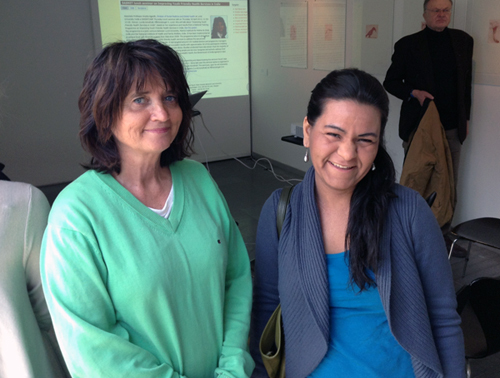 At the seminar, Anette was accompanied by PhD candidate Devika Mehra, who is also involved in the same project (on photo above). Professor Per-Olof Östergren (photo to the right) has to some extent been involved in research collaboration with India and Bangladesh over many years. Professor Emeritus Stig Larsson has also been involved in research on Bangladesh. Professor Larsson has been Director for HAREC Disability and Rehabilitation Research Centre, established in 1997 to promote and coordinate research within this field in the southern part of Sweden. It is a cooperation between five different universities in southern Sweden: Lund University, Malmö University, Växjö University, Kristianstad University and the Swedish University of Agricultural Sciences in Alnarp. In 2005, he received SEK 1 Million as a two-years grant from Sida/SAREC for a doctorate project titled ”The role of assistive technology among people with disabilities in the south: Poverty alleviation and human rights in Bangladesh”. More information about the 2005 Sida grants. In November 2008, Prof. Larsson was given SEK 1 m as a two-years grant extension for the period 2009-10 from Sida/SAREC’s Developing Country Research Council for the project on Poverty alleviation and human rights in Bangladesh. More information. Dr. Johan Borg defended his doctoral dissertation entitled ”Assistive technology, human rights and poverty in developing countries. 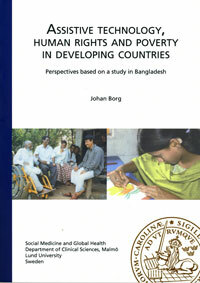 Perspectives based on a study in Bangladesh” on 17 February 2011. He has been supervised by Per-Olof Östergren and Stig Larsson. The faculty opponent was Professor Malcolm MacLachlan, Trinity College Dublin, Ireland. The project was funded by Sida/SAREC, and was part of a Friction Model project, as it is called. Abstract: Deprived of human rights, more than half of all people with disabilities in developing countries live in extreme poverty. Although considered a prerequisite for equalization of opportunities, about nine out of ten of those who need assistive technologies do not have access to them. Little is known about the socioeconomic benefits of using assistive technology in low-income countries that can inform policies and strategies. The aim of the thesis was therefore to expand the understanding of the relation of assistive technology use to human rights and poverty in these countries. This is approached theoretically and empirically. Poverty is studied in terms of deprivation of capabilities as defined by Amartya Sen. The development of the Friction Model offers an explanation of the dynamic role of assistive technology in facilitating the enjoyment of human rights and in enhancing capabilities. A content analysis of the Convention on the Rights of Persons with Disabilities concludes that it entitles them to affordable assistive technology. Ensuring this is not only a national responsibility, but a matter of international cooperation. Data from 583 people with hearing or ambulatory impairments was collected and analyzed. The use of assistive technology was found to be predictive of enjoyment of human rights and increased capabilities, particularly among hearing aid users. User involvement in the provision of assistive technology was associated with higher outcomes. The findings offer support for addressing human rights deprivation and poverty among people with disabilities through provision of assistive technology on theoretical, legal and empirical grounds. Professor Maria Emmelin is a Professor of Global Health. She has a special interest in public health evaluation and the social determinants of health. She has spent over twenty years at Umeå University and was a Senior Lecturer in Epidemiology and Public Health Sciences during the period 2004-2010. She is presently co-ordinating an international network for violence against women, and an international research collaboration on the role of social capital for health promotion. The project will conclude in 2015. In November 2013, the Swedish Research Council decided to give Maria Emmelin SEK 2.416 million as a three-year (2014-16) U-forsk grant for a project entitled ”The Role of Social Capital in preventing Discrimination of People with Handicaps in Bangladesh”. More information about the South Asia related U-forsk grants 2013.Till 2011, the U-forsk (developing country research) grants programme was administered by the Swedish International Development Cooperation Agency, Sida, but it has now been taken over by the Swedish Research Council. The aim is to establish and maintain a knowledge base of relevance to aid and development issues, plus capacity for developing country research in Sweden. Individual researchers or groups of researchers working at universities/colleges or other research institutions in Sweden have been able to apply for a grant. Swedish citizens working at the Scandinavian Institute for Asian Studies (Nordiska Asieninstitutet, NIAS) in Copenhagen have also had the opportunity. Project abstract: Syftet med detta forskningsprojekt är att studera frågan om det sociala kapitalet kan påverka människors risk att bli diskriminerade i olika sammanhang. Tidigare studier har visat att människor med ett högre socialt kapital har bättre hälsa, större chans att få en utbildning och högre sannolikhet att erhålla arbete. Men frågan om vad som förklarar dessa sammanhang är betydligt mindre studerad. Vi vill med detta projekt bidra till att öka vår förståelse för det sociala kapitalets roll. Frågan vi ställer oss är om tillgången på socialt kapital bland funktionshindrade i Bangladesh påverkar deras risk för att bli diskriminerade när de söker sjukvård, vill utbilda sig eller söka ett arbete. Målgruppen vi ämnar studera är kvinnor och män med syn-, hörsel- eller fysisk funktionsnedsättning. Genom att samla in data på det sociala kapitalet och på andra faktorer kan vi analysera det sociala kapitalets roll med hjälp av statistiska metoder. Det uppskattas att ungefär 15% av världens befolkning har någon typ av funktionshinder och flera studier har visat att man vet relativt lite om vad som kan göras för att deras situation ska förbättras, bland annat genom att minska risken för att de blir diskriminerade i olika sammanhang. Andra studier har visat att man kan förstärka det sociala kapitalet genom olika insatser. Resultaten av den här studien skulle kunna användas för att utveckla mer effektiva insatser som stärker situationen för kvinnor och män med funktionshinder när det gäller deras tillgång till hälso- och sjukvård, utbildning och arbetsmarknaden. In the spring 2012, the Swedish Council for Working Life and Social Research (FAS) announced a special call for proposals for arranging workshops/hearings to explore future research co-operation specifically with India. The purpose was to facilitate contact and the exchange of experience between Swedish and Indian researchers; to bring knowledge from the international research community to Swedish research; and to be of considerable value to research in FAS’ areas of responsibility. Decisions were taken on 3 October 2012. Go for the decisions. Abstract: Two workshops on young people’s health will be arranged in India in 2013 and 2014 on the theme of Moving Adolescents from the Margins to the Mainstream of Public Health in India. They will be organised in collaboration with Lund University’s Indian partners: MAMTA Health Institute for Mother and Child, the National Institute of Health and Family Welfare, the Public Health Foundation of India, Delhi University, and the Indian Ministry of Health. WHO has also been invited to participate. The goal will be to further develop on-going research collaboration on adolescent health, including joint supervision and exchange of PhD candidates and post-docs. Professors George Patton and Professor Susan Sawyerof the University of Melbourne, lead authors of the Lancet series on adolescent health, are invited experts. Senior researchers, PhD candidates, post-docs, and policymakers from the above institutions will participate. SMHG runs a successful two-years Master’s Programme in Public Health (MPH), focusing partly on South Asia, and many of the students are from that area (some of them coming to Lund University as scholarship holders through the Erasmus Mundus Action 2 Indo-European mobility programme, see below). Anette Agardh is the Programme Director. The aim of the programme is to provide a deeper understanding of the theories and methods applicable in public health, including health promotion and disease prevention, and to improve scientific knowledge in planning, implementing and evaluating public health measures and research. The programme can also serve as a basis for further research studies in public health. Applicants are welcome from all sectors, not only the health sector, but also from the areas of education, social work, environment and political science. More information on the Masters Programme. For over 20 years, SMGH has given a 7.5 credit course on Global Health, targeting undergraduate students at the Medical Faculty. The course includes a two-week stay in India, Indonesia, or Uganda. A collaborative exchange agreement has existed with the Christian Medical College in Vellore since 2005. Karen Odberg Pettersson is one of the course leaders for the Global Health courses. She is a senior lecturer in international/public health and teaches also at the international MPH program and the Advanced International Training course in Sexual and Reproductive Health and Rights (SRHR) for midwives and obstetricians. She has extensive experience from international field work in project development and management, education, research and consultancy. The focus has mainly been on maternal and newborn health in Africa but also Asia (India and China) and South America (Nicaragua). SMGH is also organising a 7.5 credit course on clinical practises for medical students in Africa and Asia. In South Asia this is being done under collaboration with Nepal, Bangladesh, Sri Lanka, and India. Since 2005, SMGH has implemented eight international training programmes on “Sexual and Reproductive Health and Rights”. This 15 credit course is funded by the Swedish International Development Cooperation Agency (Sida). The target group is midwives and gynaecologists/obstetricians. South Asian participants from Bangladesh, India, Nepal, and Sri Lanka have been accepted for these programmes. The programme is administered through Lund University Commissioned Education. More information. Beginning in 2009, SMGH has also implemented annual national training programmes on Youth Friendly Health Services, targeting paediatricians and gynaecologists/obstetricians. The programme consists of three weeks in India, one week in Sweden, and additional follow-up visits for implementation of change projects concerning youth friendly health services. Since 2010 these courses have been implemented in partnership with the National Institute of Health and Family Welfare and the Ministry of Health. 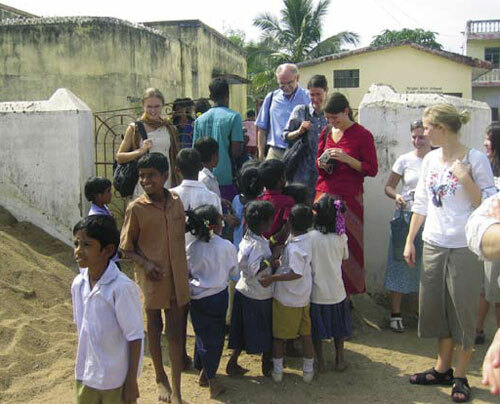 This project will run until 2013 and is one of the prioritized activities under an Indian–Swedish governmental collaboration. The 4th National Training Program (NTP), India on Youth Friendly Health Services was held over a period of 3 weeks from 19th September, 2011 to 7th October, 2011, part of it in India, and the rest in Sweden. The aim of the NTP is to orient the Indian doctors and program managers towards providing youth friendly health services and cater to the needs of the young people, with a special focus on sexual and reproductive health and rights. The NTP programs are conducted by the Division of Social medicine and Global Health, Lund University in Sweden, and the National Institute of Health and Family welfare (NIHFW), the Indian Ministry of Health & Family Welfare (MOHFW) and MAMTA – Health Institute for Mother and Child (an Indian NGO based in Delhi). The programme is funded by a SEK 3.5 m partership cooperation grant from the Swedish International Development Cooperation Agency (Sida) for the perod 2010–2013. The overall objective of the NTP is to strengthen participants’ capacity on delivering youth friendly health services mainly through the public health facilities that address the sexual and reproductive health concerns of young people in the age group of 10-24 years. The areas of work are the Indian states of Maharashtra, Himachal Pradesh, Assam, Bihar, Andhra Pradesh and Delhi. Read a report from the 4th NTP on Youth Friendly Health Services. The participants of the National Training Programme on Youth Friendly Services in India had a follow up week in Shimla, Himachal Pradesh in April 2012 to share the implementation of their change projects undertaken in their respective professional settings. The level of participation and discussion was indicative of their commitment, interest and intent to sustain the efforts to operationalize services for the adolescents. Most of the participants had managed to build systems to ensure support and continuity of their work. 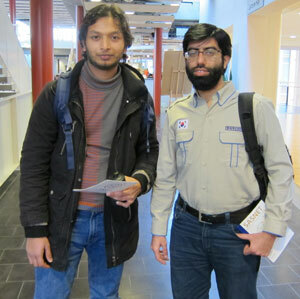 A large number of Indian students, PhD candidates, post-docs and academic staff came to Lund University during the academic year 2009-10, and another batch arrives for the year 2010-11, as scholarship holders through the Erasmus Mundus Action 2 mobility programme coordinated by Lund University. This programme was announced in 2008, and out of a total mobility of 320 persons. In the first round, 53 Indian students, researchers and academic staff were selected to come specically to Lund University. More information about the EMECW programme lot 15 (from 2009 renamed to be one out of four programmes under the mobility lot 13). Devika Mehra from Social Medicine and Global Health, Department of Clinical Sciences at Lund University, defended her doctoral dissertation on ”Sexual Behaviour among Ugandan university students: A gender perspective” on 25 October 2013. Faculty Opponent was Stefan Swartling Peterson, Professor of Global Health at Karolinska Institutet. She was selected in 2009 by the EMECW lot 15 consortium to stay at the Division of Social Medicine and Global Health, Lund University. Dr. Mehra has spent four years at Lund University as an Erasmus Mundus scholarship holder through the India lot coordinated by Lund University since 2009. Her educational background in India was Delhi College of Arts & Commerce (affiliated to the University of Delhi), but she has also studied at the University of Birmingham in UK. Devika Mehra has previous practical experience of working with HIV/AIDS programmes in local as well as regional UN organisations which is directly related to her PhD project. Go for the full-text thesis. Dr. Vikas Choudhry, a medical doctor from India, was accepted for a PhD programme under the Erasmus Mundus scholarship programme from September 2010. He has done his Master of Public Health (MPH) from Tata Institute of Social Sciences (TISS) in Mumbai, India. He is working on a research proposal within in the field of Sexual and Reproductive Health (SRH). This would involve university students, most probably in Delhi. Lund University arranged a seminar entitled ”Towards a more healthy world – change is possible. Important investments in the Global Development of Sexual and Reproductive Health and Rights” in Stockholm on Friday 11 November 2011. The half-day seminar was organised in collaboration with the Swedish International Development Cooperation Agency (Sida) and 120 colleagues from 22 participating countries. Between 2005 and 2010 Sida has invested in eight international training programmes in the field of Sexual and Reproductive Health and Rights. In these programmes, conducted by the Division of Social Medicine and Global Health at Lund University, 200 obstetricians and midwives from 30 African, Asian and Eastern European countries have participated and a total of 70 pilot projects in the respective countries have been implemented. The Stockholm seminar was held to show the excellent results, in line with the Millennium Development Goals (MDG), which this Swedish funded International Training Programme has achieved. Notable results the groups have achieved are: Reductions in maternal mortality, improvement of access to reproductive health services, improvement of antenatal care, introduction of youth friendly health services, improved family planning services and increased awareness of HIV prevention. The results were presented by the programme leaders Anette Agardh and Karen Odberg Pettersson, Lund University. Venue: Sida Headquarters, Valhallavägen 199, Stockholm. See the invitation to the Stockholm seminar. Dr. Jerker Liljestrand worked at the department during the period 2003-07 as an associate professor of public health. He left the department and Lund University on 1 January 2008. Dr. Liljestrand was mostly involved in research projects on Africa, and especially Uganda, but for some period also worked with a project entitled ”Investing effectively in maternal health. Experiencies from Malaysia and Sri Lanka during 60 years, and Guatemala today”, involving researchers from Sri Lanka, Malaysia, and Australia. As a response to a call from Lund University’s then deputy Vice-Chancellor, Prof. Björn Wittenmark, a research cooperation network between university departments active in HIV/AIDS research evolved in Lund/Malmö in 2004. The network named HARNESS (HIV/AIDS Research Network in Southern Sweden) included researchers on Public health, Sociology, Political science, Rural development, Geographical modelling, Social work, Sexuality, and Health economics. The network, thus, represents both a cross-disciplinary/faculty cooperation and a cross-college/university cooperation as it also entails cooperation between Lund University and Malmö University College. Jerker Liljestrand developed the HARNESS network. The ambition was to promote and secure funding for multidisciplinary research projects on the the AIDS epidemic, the biggest scourge humanity has experienced. Within the framework of HARNESS, the HIV/AIDS research network in Southern Sweden, Jerker Liljestrand worked on a project entitled “The Impact of Urbanization and HIV/AIDS on Mental Health in Low-income Countries”, dealing with the rapid urbanization and high rates of HIV represent serious challenges for mental health in low-income countries (where young adults, 18-30, are particularly at risk for the development of serious mental illness). The project was mainly focused on the situation in south-western Uganda, but a comparative study was supposed to be done regarding the situation in India. 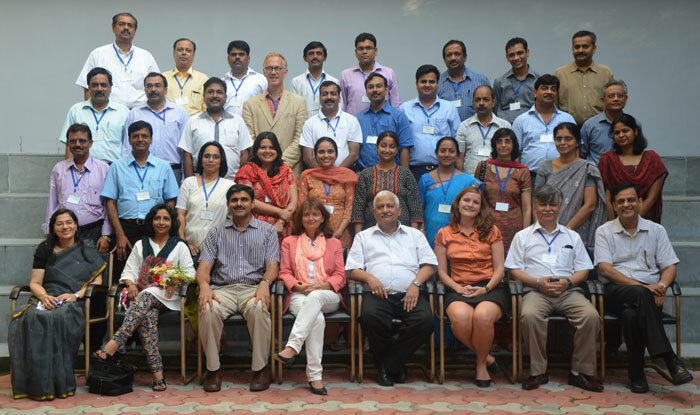 The collaborating research partners in India were Professor Sulochana Abraham, and Dr. K. S. Jacob, at the Department of Psychiatry, Christian Medical College (CMC), Vellore.